About Me | Family Photo Album | My Research | Miracles | My Church | New Home | Hawaii trip | 1st US trip | Holy Land trip | Korea trip | Macau trip | Honey Moon | 2nd USA trip | Greece trip | Testimony and Calling | My Resume | Favorite Links | Contact Me | Prayer | Physics | Computer | Virus Warning | Biblical updates | My recent situation | Request |Thank You! 11.6.2003 --- Tears have not yet dried. Heart is broken again. My father-in-law passed away in the morning (around 6:15 a.m.) of June 4. Wet Gangrene right foot and pneumoia (not SARS) are the main causes which are complications caused by Diabetes Mellitus. He is over 80+ and has been hospitalized for more than one month. President Emeritus of LTS, Dr. Andrew K. H. Hsiao, passed away on the evening of May 25, 2003, in Hong Kong, apparently from a heart attack. He was 77 years old.A Memorial Service was held at 3:00 p.m. on Saturday, June 7, 2003, at Truth Lutheran Church on Waterloo Road in Kowloon. I have set up a webpage (19 April 2003 ) on SARS: Severe Acute Respiratory Syndrome: It contains most of the up-to-date information on SARS. It contains information from all over the world. It covers newsupdate, general information, forum and even the medical journals. It is comprehensive and updated. The webmaster role of God's Glory Ministry is finally handed over to others and today I have had a meal with Gloria Mok who is in charge of this ministry. It is a joyful fellowship. Besides, the webpage has less and less storage now, so I am looking for a new FREE web hosting with LARGER storage. Teaching Greek is a challenging, but enjoyable experience. I feel that the students who learn this language will eventually gain joy in reading the Bible in Greek and help their ability in learning language. It will help them to master English and other Indo-European languages. 14.11.2002 -- One of my classmate's mother has died. Today I go to her furneral. Sad! 18.8.2002 --- German On-line Translation of this site is added. I have tried two different translation engines: Please try them: Deutsch (1); Deutsch (2). Since it is translated on-line, so please wait for a moment for the translation. Brand New E-zine in Chinese(Traditional Big-5 encoding / with Bi-lingual index: Chinese & English ) is established. 31.12.2001 --- We have just walked on the road in Tsim Sha Tsui with my siblings and father. 23.10.2001 --- We have won the Webpage Design Competition of Dept. of Applied Maths. in Poly U. 2.10.2001 --- New Message Board is added. _9.9.2001 --- I plan to study Th. D. full time for several months. _9.8.2001---- Just back from KK, Sabah (where I have my honeymoon) with all my siblings' and their kids. A new pages on the info on the Holy Land, Egypt and Greece will soon be available. Plus, "New Home" may have a panaroma view later. I am "re-activating" the material in my home now; so it is like a "rubbish heaven" now. 5/2002 ---- Korea :- (2nd trip) enjoying SPA. Two trips to KK, SF, Macau (?) and, Korea. 31.12.2001 -- -We have just walked on the road in Tsim Sha Tsui with my siblings and father. Besides I help the new Christian Organization: Sunrise Ministry in setup its webpage and teach in one of its courses. I have made a NEW webpage on my study: "Philip Yim's E-zine". I update this E-zine more frequent than this one. 23.10.2001 --- We have won the Webpage Design Competition of Dept. of Applied Maths. in Poly U. The fourth one in this link is designed by us. More updated on the Biblical research and other researches have been posted on this new webpage: All researches, Biblical or Theological. 23.9.2001 --- New experience in other types of worship in different churches enriches my Christian life. Mastering Flash is not easy and cannot achieve the expected result yet. Photoshop is not easy to master too. _9.9.2001 --- I plan to study Th. D. full time for several months and during this period, I hope to find a suitable pastoral job. I plan to finish my translation work within two to three months. Plus, the webpage for my brother's company: Kwok Wah Motors, is in progress. I have learnt to use more software and upgrading my skills in web design. 31.8.2001 --- I have spent more time to rest; and thank for my friends who phone me to show their support and concern. I have learnt to use Flash. I plan to set up a webpage for my brother, Peter. Of course, I will use Flash on that website! Now I am still designing the layouts; the continual follow-up and daily updates of the site are the headaches I am trying to solve. Besides, Photoshop and PhotoImpact are good tools too. I have used them before; but not good at them enough to have good results. The photo on this new Sabah trip will be posted as soon as possible. Now I have to catch up with my study and the translation work on a book of spirituality. My future path is still waiting the guidance of the Lord. 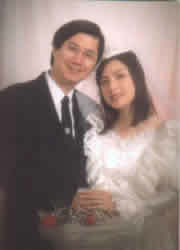 9.8.2001----- Just back from Kota Kinabalu (The city of the Holy Mountain), Sabah (where I have my honeymoon) with all my siblings and their kids. This time we have stayed in the new Shangri-La's Rasa Ria Resort, Kota Kinabalu (actually in Tuaran), but we have also visited and enjoyed the facility in our honeymoon hotel - Shangri-La's Tanjung Aru Resort, Kota Kinabalu. I have a lot of new experience in this trip: first diving down to 11m, up in the sky above 200 feets, second time visit on honeymoon hotel, first all siblings' holiday trips and seeing two "Jungleman"s in life close to 5 feets. Photos and details on this trip will be available later. 8.8.2001 ---- The HKCEE (Form 5 public examination) result has a great impact on the youth fellowship members who have participated in this year. The result is ..... Please pray for them and may God guides their ways. 3.6.2001 ----- The church has continually growth to its historical high and the trend is up and the relationship between them has improved. The witnessing power has raised to a new height and the atmosphere is very good. Please pray for some members: their parents are in severe illness; and one has passed away. The challenge from Satan is getting stronger and stronger. 22.5.2001 ---- Some parents of our members have severe diseases. But the evangelistic worship service has a lot of newcomers. We hope that more and more relatives and friends will believe in Christ. 28.2.2001 ---- I have tried to write an article, but lack of time to do so. Besides, my study on Th. D. has no progress. But teaching in the evening school of LTS is good, I enjoy it. My teaching on Romans in the evening school has just finished. 11.2.2001 ---- The recruit continues and has become one of the hardest choice in the church. There are totally 7 candidates with 2 rejected by us, and 2 redraw their applications. One is waiting for the 2nd interview; the other two have not yet started the first interview. But the choice is difficult; and .... Besides, I will start to teach Matthew in the coming month. 2.2001 ------- We are recruiting a Bible woman (ministress) to help in the church's work. It is nice that four ones apply, but the choice and preparation process is a difficult one. Some members' relatives are sick and a new baby is born to us. Many new projects to start: Bible reading (and spiritual reading); new adult Sunday school courses, and some other plannings. Here you'll learn all about me: my interests and hobbies, the people in my family, my researches, my resume and a list of my favorite links to other sites. The trips I have with my charming and supportive wife.